Writing the perfect message for your boyfriend on his birthday is no easy feat. Whether you’re after a message that’s witty, passionate, or charming, this article has you covered. Read on for a selection of loving messages to tell your boyfriend just how much he means to you on his special day. I can’t wait to celebrate with you on this special day. Being with you never fails to make me smile, and I hope that my love will bring a smile to your face. Today is your day! I’m so lucky to love and celebrate you, not just today, but every day. It’s your birthday, but when I’m with you, every day is special. Here’s to being another year older and another year in love. Every day I’m in love with you is a wonderful adventure. Let’s celebrate the amazing person you are today, I love you so much. I love you more than words can describe. Wishing you a day full of happiness, laughter, and excitement, because you deserve a birthday as special as you are. I love you now and always. Let’s make this birthday one to remember, because I’ll never forget how much joy your love brings me. You make me happier than I’ve ever been, and your birthday is the perfect chance to say how much you mean to me. Your kindness, intelligence, and charm are just a few of the many reasons why I love you. Your birthday only comes once a year, and I’m so excited to celebrate everything that makes you special. When it comes to our love, this is only the beginning. There aren’t enough presents in the world to prove how much I love you. Loving you never fails to make my day, and I hope you know just how loved you are. It’s your birthday, and I know I don’t say it enough: I love you, I love you, I love you. Let’s make today magical. Happy birthday to the kindest, sweetest, most handsome man I know. You amaze me each and every day, and today is no exception. 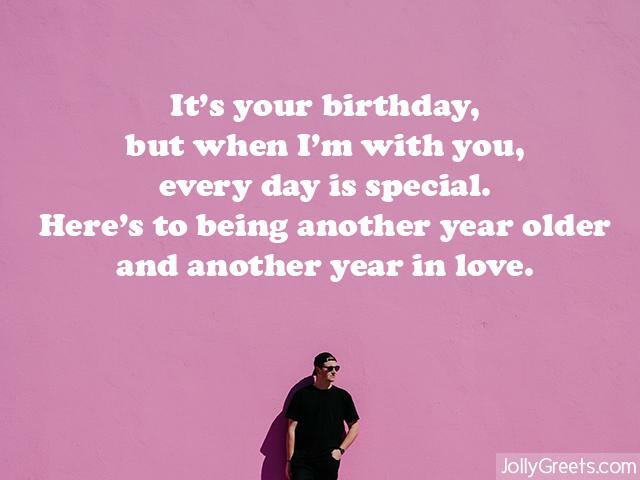 I love you, even despite your age. Stay young at heart, my dear! Another year older, and another year of my friends forgetting your name. Happy birthday, love! It’s your birthday. My gift to you? The chance to finally meet my parents! Sending you love and good luck wishes. I love you *almost* as much as I love my dog. Wishing you the happiest of birthdays, my dear boyfriend! I’m excited to celebrate your special day today, even though I’d rather be watching Netflix. Have the happiest of birthdays, my love! We may be miles apart, but my love for you is still growing stronger. Happy birthday to you, and wishing we’ll be together soon. I’m thinking of you every day, but especially on this special one. Wishing you the happiest of birthdays, and that I were there with you. It’s your birthday, so you get to make a wish. But I know if I had one, I’d wish to be next to you. Loving and missing you always, birthday boy. I’d give anything to be with you on this special day. 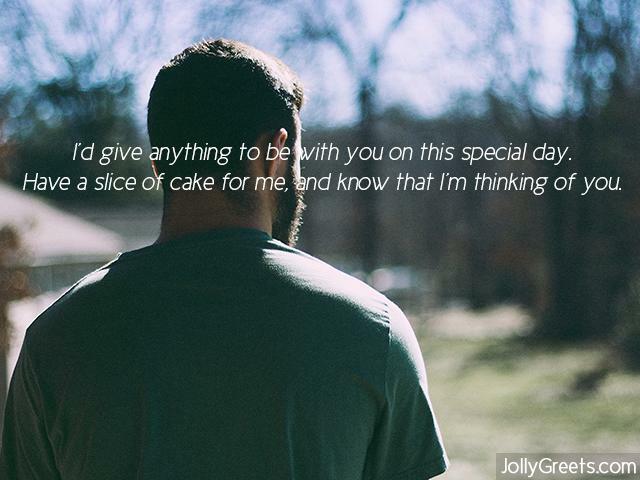 Have a slice of cake for me, and know that I’m thinking of you. Being apart from you isn’t easy, but thinking of you smile on your birthday is a gift of its own. Happy birthday to the most wonderful man I know, I love you. There’s little I wouldn’t do to tell you I love you in person, especially on your special day. Have the happiest of birthdays, I can’t wait to see you next. No matter how far we are from each other, you’ll always have my heart. 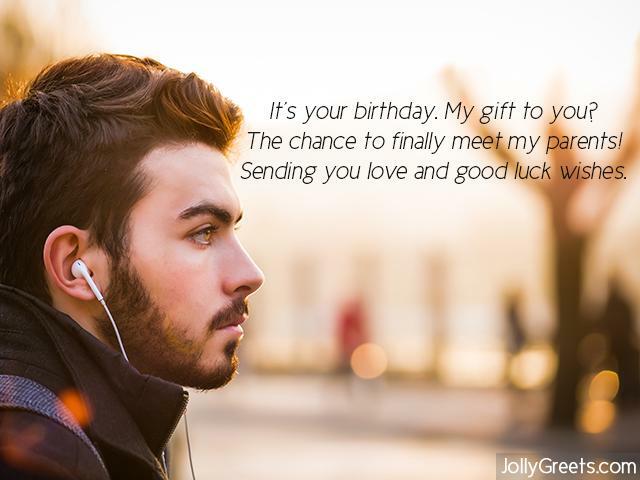 Wishing you the best birthday ever and hoping to see you very soon. Distance is no match for my love for you, especially on your birthday. I’m loving you and thinking of you always. Finally, the perfect excuse to eat cake and tell you how much I love you! Wishing the happiest of birthdays to the best boyfriend ever. It’s your special day, so eat all the birthday cake your heart desires. All I know is that my heart desires you. Happy birthday. Eating birthday cake is one of the best things ever, second only to my love for you. Happy birthday, my wonderful boyfriend. What’s a birthday without cake? Being the best boyfriend ever, you can have as much cake as you want. Happy birthday! Sponge cake, chocolate cake, butter cake, vanilla cake, carrot cake–when it comes to birthday cake, the options are endless. But when it comes to lovers, I’ll always choose you. Happy birthday to the best boyfriend I could ever ask for. [25th birthday] You may only be a quarter of the way towards turning 100, but you’ve got 100% of my heart. Happy birthday, my dear boyfriend! [21st birthday] Let’s raise a glass to love, birthdays, and being together. Cheers, my loving boyfriend! [20th birthday] You’re no longer in your teenage years, but you’re still my teenage dream. Happy 20th birthday my love! [50th birthday] It’s your 50th birthday, but my love for you is timeless. Happy birthday to you, and here’s to many loving years ahead.